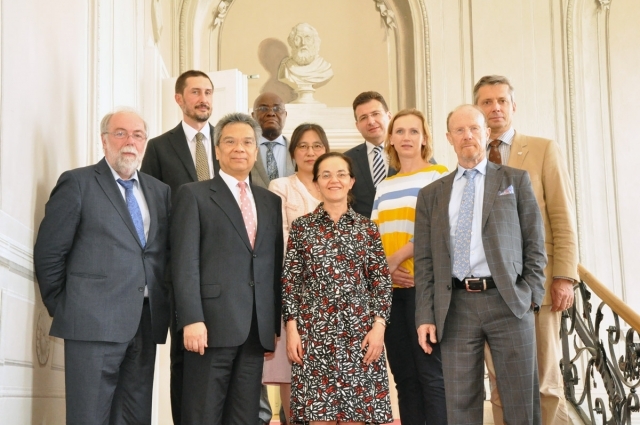 IACA’s International Academic Advisory Board (IAAB) met in Laxenburg last week to discuss the organization’s current and upcoming programmes and trainings and provide input on the academic elements of the draft Work Programme for 2017 to 2020. During the two-day gathering on 5 and 6 July, the Board shared its thoughts on and discussed in detail the academic framework of IACA’s future PhD programme in anti-corruption studies, which is being introduced with a small initial enrolment. The Academy’s programmes and their final diplomas, including a PhD, are recognized in line with the (EU's) “Bologna Process". IAAB members also received an update on recent programmes and activities, including in-class sessions of the Master in Anti-Corruption Studies (MACS) at IACA and in Tbilisi, Georgia, as well as numerous tailor-made trainings. The IAAB, chaired by Professor Hans-Heiner Kühne from the University of Trier, serves as an advisory function in view of education, training, and research. It currently consists of ten internationally renowned academics and practitioners.